This Canadian comedy, filmed in black and white and color and adapted from Lepage's play The Seven Branches of the River Ota. In October 1970, Montreal actress Sophie (Anne-Marie Cadieux) appears in a Feydeau farce at the Osaka World's Fair. Back in Montreal, her boyfriend Michel (Alexis Martin) watches the October Crisis on TV and sees Canadian Prime Minister Trudeau declare the War Measures Act. The Canadian Army patrols Montreal streets. Sophie learns she's pregnant and phones Michel. However, Michel is immersed in politics, while Sophie rejects the amorous advances of her co-star (Eric Bernier), becomes friendly with a blind translator, and passes an evening with frivolous Canadian embassy official Walter (Richard Frechette) and his wife Patricia (Marie Gignac). Meanwhile, in Montreal, Michael plots terrorist activities. I initially saw LePage's third feature at the London Film Festival last November, but got the opportunity to see it again during its recent very short run in London. Like its predecessor, 'Le Polygraphe' (96), it is a far more rich and satisfying film than a single viewing suggests. The initial scenes are academic and slowly built up, giving no real clue as to the films agenda or tone, and in this light the rest of the film may appear a little confused first time round. For the most part, 'No' is ostensibly a slapstick satire which takes place during one night in 1970. Its narrative is split between Sophie, an actress playing in a French farce at the Canadian pavilion of the Osaka world fair, and her boyfriend back in Montreal, involved in a Quebec separatist plot to plant a bomb in protest against the Canadian governments introduction of martial law (these scenes are shot in black and white). The themes involved are similar to that of his earlier films, calling into question the notions that cultural identity is tied in which language, and whereas the issue of Quebec separatism is clearly the focus for the story, LePage's approach remains admirably balanced and anti-didactic. 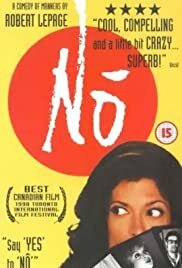 Stylistically, 'No' shares similar motifs with the rest of his oeuvre as well; the seamless melding of dual narratives, (as 'Le Confessional' (95) alternates between the past and present, 'No' does between Montreal and Osaka), the subtle visual gags and the intricate scripting all pinpoint this to the work of LePage. Unfortunately, as a political satire, much of the humour will be lost on those with no prior knowledge of Quebec politics, and this will no doubt limit its audience. Certain scenes seem stagey and protracted (the improvised feel of the drunken restaurant scenes between Sophie and the Canadian cultural attache, for example), betraying LePage's theatrical background. Visually the film is less impressive than his earlier films: Compared with the majestic snowscapes of 'Le Polygraphe' or the sheer opulence of the 'Confessional', with its predominance of interior scenes, the latest simply seems smaller and low key. 'No' is a film which demands a lot intellectually from its audience, though ultimately there is still a lot of humour and enough stylistic flourishes to impress. Similar to the rest of his work, it is a flawed yet fascinating film from a highly individualist film maker, and I for one can't wait until the next one.